most important to future learning. We believe that preparation for academic achievement, which is supported by healthy self-esteem, should take place long before the child enters Kindergarten. 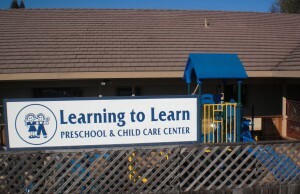 Learning to Learn offers graduated and distinct programs for children ages 2 years old through 5 years old. Each program challenges the child at his/her own level of maturity and academic achievement. Tuition and hours of attendance follow a flexible but regular schedule. equipped facility designed especially for young children. Co-owners are Jeanne Cousino and Helen Dexter Johnson. Jeanne has a Masters Degree in Education, a California Teaching Credential, and has been teaching in public and private schools since 1964. Helen has a B.A. in Education and has been owner of Learning to Learn since 1968. Before and After-school programs for K through 8th grade at are available at our affiliate, Redwood Country Kids Club.